Utility tongs are used to serve any type of food. This tool has an ergonomic handle and special shape to not break the food. 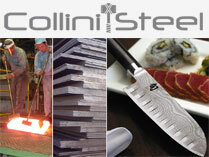 Global GS series includes small and medium-sized Japanese kitchen knives for general use. The handle is well-balanced with an original triangular shape. In addition, this series includes kitchen utensils as a complement to prepare any dish, chopsticks to eat as the traditional Japanese way and skewers to get a perfectly decorated dish. Made of Cromova 18, a high quality stainless steel designed designed exclusively for Global knives and utensils. It contains a 18% of Chromium, that contributes to stain resistance, and also molybdenum and vanadium, to improve edge retention. We recommend that you wash the Global products by hand with dishwashing liquid and warm water, and then rinse and dry the utensil with a towel immediately. It is very important not to use the dishwasher with the Global products, in order to protect the steel and to avoid exposure to extreme heat and powerful detergents.